The single chamber PetPacer-SR and the dual chamber PetPacer-DR are fully automatic rate responsive pacemaker systems exclusively made for Dextronix. 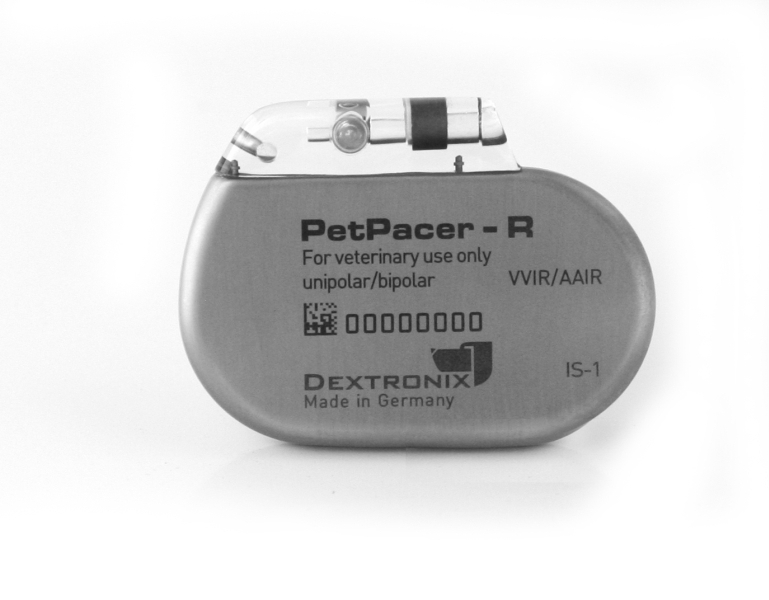 Active Capture Control (ACC): PetPacer-R and DR measure the effect of ventricular pacing and adapt the pacing amplitude to meet your pet patients’ needs. ACC provides a back-up pulse with increased energy during non-capture pacing including a programmable safety margin which extends the operating time. 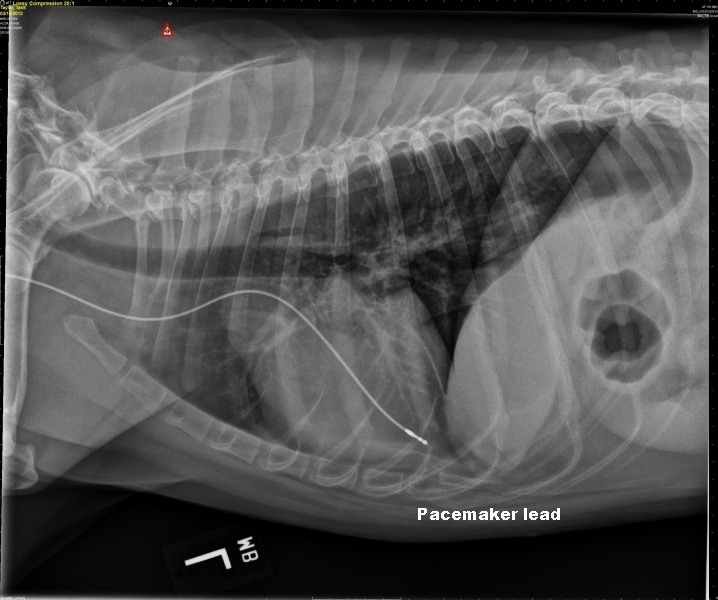 Wideband IEGM Recordings: Automatic wideband recording of intracardiac events provides the veterinaruan with important information regarding the pet patients’ cardiac status with up to fifteen recordings of ten seconds each. Recordings include clinically relevant trigger criteria with intelligent memory management and storage of the event data before and after the trigger. Auto Initialization: PetPacer-R and DR detect the connected leads and automatically initiate preventive safety features such as PMT management, mode switching, threshold monitoring and statistical data capturing. Are the pulse generators new? Dextronix pulse generators are all new with full battery life and sterile. Each generator set includes the necessary accessories to attach the leads (e.g. screw driver). Are the pulse generators sterile? All Dextronix pulse generators and leads are new, sterile and come with full warranty. Does Dextronix manufacture the pacemakers? Dextronix pulse generators are manufactured by Biotronik exclusively for Dextronix under private label. The system functions, features, performance and quality are identical to human pacemakers. Can I use other than Dextronix leads with a Dextronix pacemaker? The pulse generators are compatible with any implantable pacing lead that has IS-I connection and therefore can be used with Biotronik, Medtronic, St.Jude Medical, Boston-Scientific, Sorin leads. (All modern leads have IS-I connectors). The pulse generator will automatically recognize the lead type and configuration. Do I need the programmer to implant the pacemaker? The pacemakers are fully functional and pacing when implanted. The sensing functions and automatic rate adaption will adjust to the patient. The programmer is needed to change the standard settings. See manual for details. Can I use the Programmer with other pacemaker brands? The Implant programmer can read the ECG traces of other brand pacemakers but cannot change/reprogram any non-Biotronik or non-Dextronix pulse generator. All implantable device manufacturers have their own proprietary programmers and software, they are not inter-compatible. 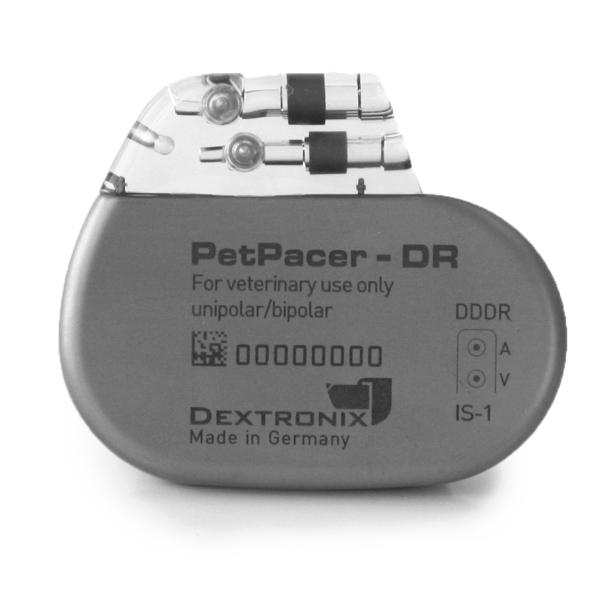 PetPacer is a multi‑programmable, single and dual chamber pulse generator with rate‑adaptive pacing. The PetPacer pulse generators is based on Biotronik’s state of the art pacing system with two methods of rate‑adaptation. Rate‑adaptation is achieved through programming of either the unique principle of closed‑loop stimulation (CLS) or by motion‑based pacing via a capacitive accelerometer. The basic function of CLS involves the translation of myocardial contractility into patient‑specific pacing rates. Specifically, the pulse generator monitors and processes the intracardiac impedance signals associated with myocardial contraction dynamics. Changes in the waveform of this impedance signal are associated with changes in the contraction dynamics of the patient’s heart due to the heart’s inotropic response to exercise and acute mental stress. By monitoring these changes, the pulse generator can provide a pacing rate that is appropriate and specific to the patient’s individual physiologic demands due to exercise and acute mental stress. For standard motion‑based rate‑adaptation, the Evia is equipped with an accelerometer located within the pulse generator. This sensor produces an electric signal during physical activity of the patient. If a rate‑adaptive (R) mode is programmed, then the accelerometer sensor signal controls the stimulation rate. * The corresponding intervals t correlate with the rates f by the formula t = 60.000 / f (t in ms, f in ppm). † In the event of electronic defect. ‡ Rate Limitation changes as the Pacemaker approaches End of Service. The Rate Limitation is nominally 190 ppm at Beginning of Service (BOS) and can reach 220 ppm at End of Service (EOS) due to battery depletion. Availability of the following functions is dependent upon pulse generator configuration.